Greensleeves Records – the iconic UK label that was acquired by reggae powerhouse VP Records in 2008 – has been operating for 40 years in the music business. That’s now celebrated with a new – and extensive – collection of classics cuts released over the years. The 40 track – what else – double disc draws from Greensleeves wide-ranging catalogue of razor-sharp roots and dancehall from the 70s, 80s, 90s and 00s. The label has managed to maneuver through a diverse set of sounds coming mostly from Jamaica and the UK. The album doesn’t come with any gems for collectors, but it’s a great gateway to reggae, especially dancehall from the early 80s, a period when Greensleeves dropped a truckload of classics albums and 12” discomixes. Featured on the set are scorchers like the Wailings Souls’ War, Johnny Osbourne’s Fally Ranking and Eek-A-Mouse’s Wa-Do-Dem. You can also find a truly international hit song like Shaggy’s Oh Carolina on Total Reggae Greensleeves. This is a great introduction to one of the greatest reggae labels. On Record Store Day 2016 reggae powerhouse VP’s reissue imprint 17 North Parade dropped a limited edition 7” box set collecting 14 rock steady gems. This release has now been expanded with another 26 cuts and released as a double CD celebrating the 50th anniversary of rock steady. This comprehensive collection comes with timeless hits and ultra-rare gems showcasing the impact rock steady has had on Jamaican and popular music. Rock steady only lasted for about two years – 1966-1968 – but is an undeniably influential genre with riddims that have been versioned and covered countless of times. The slow and melodious rock steady paved the way for the evolution of reggae and how it sounds today. First Class Rock Steady shows many aspects of the genre and includes love songs, dance celebrations, conscious cuts and beautiful instrumentals played by some of Jamaica’s finest musicians, such as Tommy McCook, Lynn Taitt and Bobby Ellis. Sensational songs like Hopeton Lewis’ Take It Easy, The Techniques’ You Don’t Care and Alton Ellis Rock Steady helped to put Jamaica on the musical map and the music still sounds fresh today. Following two excellent albums in 2011 and 2014 – Judgement Day and Destiny – Jamaican roots rockers Raging Fyah signed to reggae powerhouse VP’s subsidiary Dub Rockers and recently put out their third album Everlasting, a bombastic set with infectious melodies, lush harmonies and sing-a-long choruses. Raging Fyah formed about ten years ago after several of the five members had met at Edna Manley College of Visual & Performing Arts in Kingston. Their elegant sound is inspired by reggae bands such as Third World, Steel Pulse and Aswad and they often tackle topics of socio-economics and politics together with uplifting messages about hope and inspiration. Everlasting – produced by Llamar “Riff Raff” brown, whose credits include work for Stephen Marley, Damian Marley and Morgan Heritage – features J Boog, Busy Signal and the stylistically superior Jesse Royal on guest vocals. The latter kills it as usual on Humble and Busy Signal offers some well-needed edge to the pop-flavoured Would You Love Me. Raging Fyah is at their best when staying on the grittier side of the reggae spectrum. The sparse and dark Raggamuffin is one such highlight, the roaring title track is another. Everlasting has several irresistible moments – even though a few might be slightly too slick and polished – and passionate and expressive vocalist Kumar shines throughout this sonically sophisticated collection. About two years ago reggae powerhouse VP Records announced a collaboration with renowned reggae historian and label head Steve Barrow, one of the founders of the legendary Blood & Fire label. Not much materialized from the collaboration and Steve Barrow left. But one can guess that the most recent release from VP’s subsidiary 17 North Parade might be a result from the Steve Barrow and VP collaboration. Horace Andy’s In the Light and its dub companion In the Light Dub were namely reissued by Blood & Fire in 1995 and both are now reissued by 17 North Parade. The sets were however originally put out in 1977 and the vocal version was recorded as a full album with two dedicated producers rather than a collection of singles for a variety of producers. Not always standard in the world of reggae. Horace Andy is one of the most distinctive voices in reggae and several singers have followed in his footsteps over the years. In the Light is one of his best albums and was produced by Horace Andy himself along with the late producer Everton DaSilva. It includes a number of new recordings along with updated versions of classics like Fever and Problems. The dub version is superb and shines light on the excellent musicianship provided by some of Jamaica’s top session players. The dubs are explosive with the usual emphasis on the rhythm section. When these sets were reissued some 20 years ago they reached a new and wider audience and now they are finally made widely available once again. The late and great Augustus Pablo had a distinctive musical vision and his take on reggae is inimitable and his productions are easily identifiable. Organic and dynamic with his typical Far East sound. He was no stranger to instrumentals and was responsible for the massive melodica cut Java. His music has been heavily reissued and now reggae powerhouse VP has a fresh addition to the Augustus Pablo section in the shelves. The compilation Rockers International was originally released in 1980 and showcased a bunch of the artists he was currently working with, including Earl Sixteen, Norris Reid and Delroy Williams. 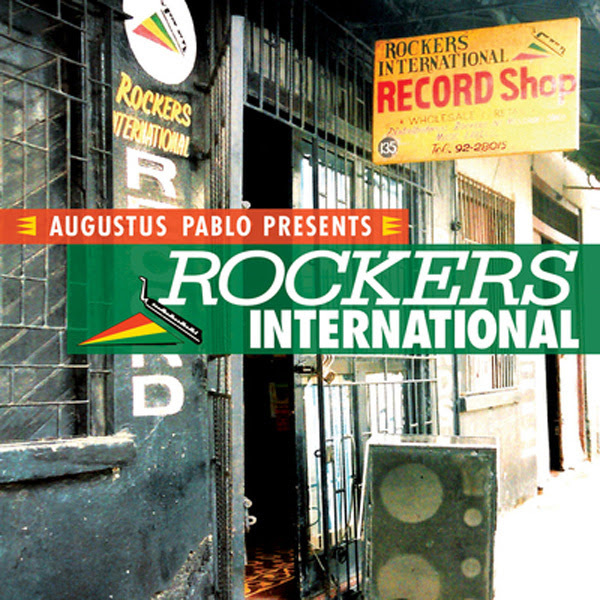 Its follow up – Rockers International Vol. 2 – was put out in 1992. Both are now available again on one lovely double disc with liner notes by reggae historian Harry Wise. The 28 track compilation features several thunderous instrumental gems from Augustus Pablo himself along with earth-shaking dub versions and affecting vocal cuts from the likes of Jacob Miller, Junior Delgado and Jah Levi aka Hugh Mundell. This album draws deep from the Augustus Pablo vaults and showcases signature productions from his golden era. His music is timeless, spiritually inspired and definately unique.